Flood-stricken towns in northern England's picturesque Lake District braced themselves for more rain on Saturday, following the wettest day in history which killed one police officer, left dozens of others trapped in their homes and washed away bridges. The BBC reports there are 22 flood warnings in force across Scotland, northern England, the Midlands and Wales, with four being "severe." Police said they were still conducting a search and rescue operation in the hardest-hit town, Cockermouth, where the water was receding. Emergency services said more than 200 people were rescued from Cockermouth and about 1,000 homes were flooded. "We're looking today to sort of work with our colleagues from the RAF and we will search every premises along the main street, those where we know people are still resident that have elected to stay in their houses but all empty premises as well, just to check that they are empty, that we can find everybody, that they're accounted for," Chief Superintendent Steve Johnson told Britain's Sky News. Four bridges collapsed in the county and 11 remain closed due to fast-flowing floodwaters. Police were warning people not to use bridges until they were deemed safe by engineers. 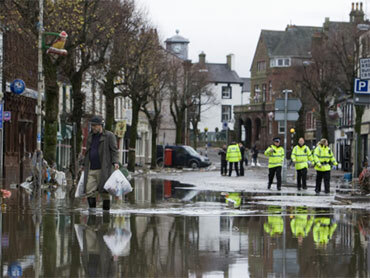 British soldiers on Friday conducted house-to-house searches for those trapped by floods as deep as 8 feet. Troops also dropped down on lines from Royal Air Force helicopters, breaking through rooftops to pluck people to safety. On Friday, Cumbria Police said Constable Bill Barker, 44, died as he joined rescue attempts. He was swept into the surging waters when a major bridge collapsed. British Prime Minister Gordon Brown praised the rescue efforts during a visit to Cumbria police's headquarters in Penrith. The Prime Minister also visited a flood relief centre in Cockermouth on Saturday morning and talked to people who had to leave their homes because of the floods. In a message to local officials, Queen Elizabeth II said she was "deeply concerned and saddened by the dreadful flooding across Britain." Britain's Met Office said a record 12.3 inches of rain fell in 24 hours in the area - the heaviest rainfall ever recorded in the United Kingdom. Cockermouth, a market town 330 miles northwest of London, lies at the junction of the Cocker and Derwent rivers and is known as the birthplace of poet William Wordsworth.